In my activity, I'm calling a second activity from the main activity by startActivityForResult. In my second activity there are some methods that finish this activity (maybe without result), however, just one of them return a result. For example, from the main activity I call a second one. In this activity I'm checking some features of handset such as does it have a camera. If it doesn't have then I'll close this activity. Also, during preparation of MediaRecorder or MediaPlayer if a problem happens then I'll close this activity. If its device has a camera and recording is done completely, then after recording a video if a user clicks on the done button then I'll send the result (address of the recorded video) back to main activity. How do I check the result from the main activity? In your SecondActivity set the data which you want to return back to FirstActivity. If you don't want to return back, don't set any. Now in your FirstActivity class write following code for the onActivityResult() method. @ismail Suppose in the SecondActivity some exception occurred, in that case also you need to return the result to the FirstActivity,so you can set the result as "RESULT_CANCELLED" in the catch block and return to FirstActivty and in FirstActivity's' 'onActivityResult() you can check whether you got the success or failure result. @FranciscoCorrales If you have to start SecondActivity from AsyncTask, Yes you can do this. @Nishant How to implement the same thing in fragments instead of activity? finish isn't called after startActivityForResult? @Lei Leyba No finish() is not called after calling startActivityForResult().First Actvity will move to pause state. You can use setResult(RESULT_OK); for example directly before calling finish(); without creating a new intent in newer versions of android. Works perfectly for some simple use cases. 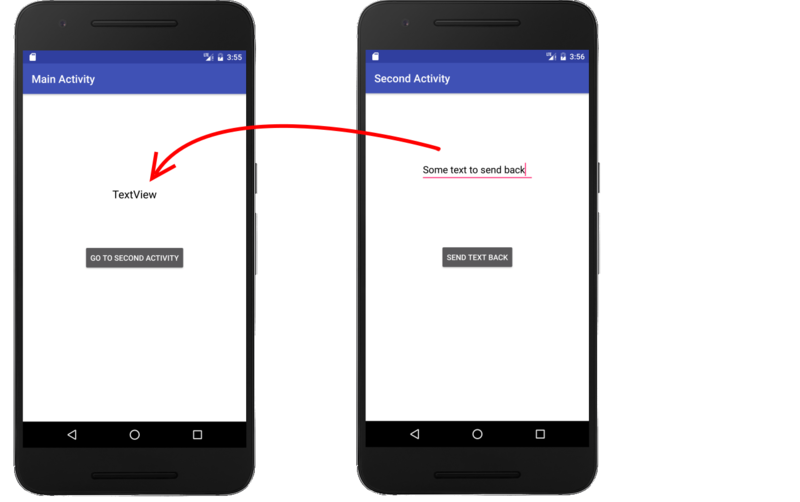 In this part, you decide whether you want to send data back or not when a particular event occurs. Eg: In activity B there is an EditText and two buttons b1, b2. Clicking on Button b2 does not send any data. To see the entire process in context, here is a supplemental answer. See my fuller answer for more explanation. If you are calling startActivityForResult() from your Fragment, the requestCode is changed by the Activity that owns the Fragment. And I'm not actually modifying the Intent that was used to launch the current activity, I'm just adding an extra called "result"
Wow! works great. getIntent() seem to be a perfect way to return data to unkown activity, from where the activity has been called. Thanks! First you use startActivityForResult() with parameters in first Activity and if you want to send data from second Activity to first Activity then pass value using Intent with setResult() method and get that data inside onActivityResult() method in first Activity. How to check the result from the main activity? requestCode identifies which app returned these results. This is defined by you when you call startActivityForResult(). data holds any information returned by this app. This may be null. This seems silly but works pretty well.